A male bufflehead uses one of his adorable pink feet to scratch an itch while swimming across Rest Lake. 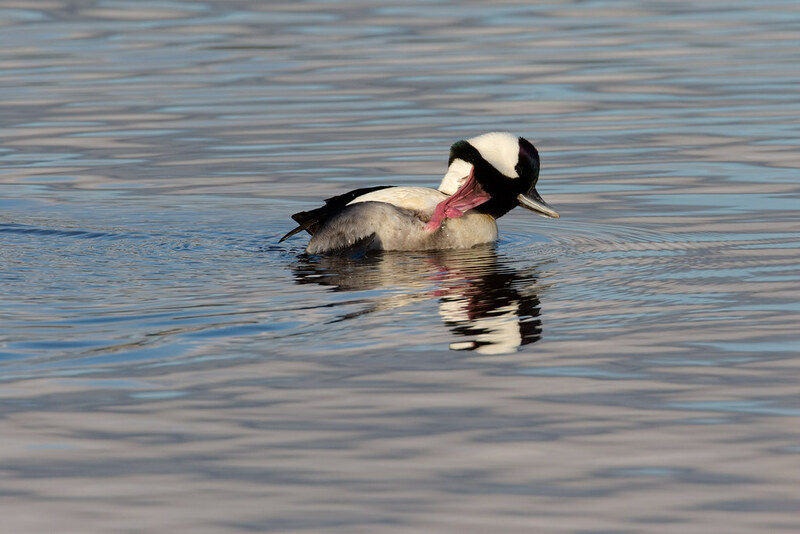 This entry was posted in Birds and tagged auto tour, bufflehead, preening, Rest Lake, Ridgefield National Wildlife Refuge, River S Unit, swimming, Washington. Bookmark the permalink. Nice. Buffleheads are very common on the lake and sound here, but the little buggers are always swimming just out of reach of my lens. Frustrating because they are very good looking ducks. They’re pretty shy even at Ridgefield’s auto tour where you stay in the car, so my pictures from there are from the rare times one will swim close. I have seen them in at least one city park in Portland (Crystal Springs) where they are habituated to humans and will swim up close even when you’re on foot. But it’s always fun when one of the shy ones trusts you enough to come close, although sometimes it’s a very long wait with no success.